I am still chuckling to myself after writing that blog post title. I am by no means an "egalitarian." That word has a very specific meaning in today's culture and I don't fit the bill. However, I have been confronted with the more general presentation of how "egalitarian" western Christianity is as a whole from the perspective of outsiders. I'm not sure how this blog will read. I'm still reeling from my reading but I'm trying to but digital 0's & 1's in their proper place. 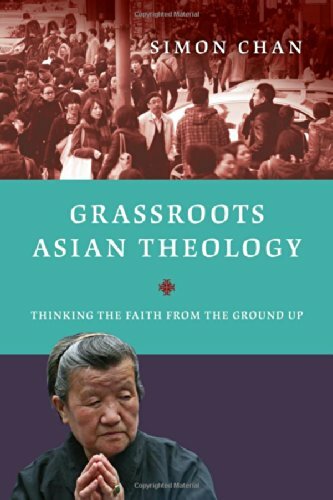 InterVarsity Press was kind enough to send me a review copy of Simon Chan's Grassroots Asian Theology. I wasn't expecting a systematic theology, but I also wasn't expecting what I'm reading. Each page presents a new wave of information and perspective. One of these perspective challenges is the sneaky egalitarianism of western Christianity (conservative and liberal). Let me place before you the creedal evidence that convinced me that I am a closet egalitarian. Take note, I am not persuaded that Chan's challenge is valid for all western Christians. But it struck a chord with me. And in one Lord Jesus Christ, the only begotten Son of God, and born of the Father before all ages. (God of God) light of light, true God of true God. Begotten not made. And (I believe) in the Holy Ghost, the Lord and Giver of life, who proceeds from the Father. I am a fan of the Nicene Creed. I affirm it in every way. But I've always been tripped up on the "eternal begetting" (WCF 11.3) of the Son and "eternal procession" of the Spirit. I've even read with growing frequency american theologian who share my struggle (in particular the late Robert Raymond) and have expressed concerns about the language of begetting. I haven't known how to think of it and affirm it without feeling like I had done a disservice to the other Persons of the Trinity. The Nicene Creed is not alone however. The Father is made of none, neither created, nor begotten. The Son is of the Father alone; not made, nor created, but begotten. The Holy Ghost is of the Father, and of the Son neither made, nor created, nor begotten, but proceeding. Again, I affirm the Athanasian Creed. I am fully in the creedal Trinitarian camp. However, again I am gripped by the language used and how to understand what is meant. Some may not feel the way I do about this language. But in reading Chan's work I might now have an answer to why I was inclined to dislike this language. And in this Trinity none is afore or after Other, None is greater or less than Another, but the whole Three Persons are Co-eternal together, and Co-equal. So that in all things, as is aforesaid, the Unity in Trinity, and the Trinity in Unity, is to be worshipped. He therefore that will be saved, must thus think of the Trinity. But the same person(s) that wrote this great line of equality also wrote the paragraph above it. The Father, Son and Holy Spirit are equal. But the Father is neither begotten nor proceeding. So that even in their equality, the Son and Spirit are dependent upon the Father. This still sounds like a contradiction to me. A paradox perhaps to use softer language. And yet Chan argues this tendency in me is more closely associated with the egalitarian worldview than theological objection. I am inclined to agree with him and am glad to have had my eyes opened to a preconceived slant in my thinking.